Spring is coming and time to think of the annual sponsored walk organised by Newbury Rotary Club. 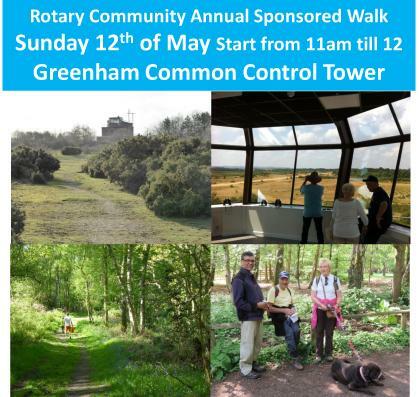 This year's walk will start and finish near to Greenham Common Control Tower which is of great interest in itself and has good parking and other facilities. There will be a route of about 8 miles taking in Greenham Common and surrounding countryside going through Bowdown Woods and then down to the Kennet and Avon Canal and then back to the Common. There will be another shorter route based on the Common which would be suitable for younger children and will be wheelchair friendly. As in previous years start time will be from 11 am until 12 noon. The routes will be fully signed and marshalled. Walkers are encouraged through sponsorship to raise money for their own good causes. A donation of £1 for each sponsored walker is requested. Non sponsored walkers are very welcome to join us and asked also to give a small donation which will go to Newbury Rotary Club supported charities a list of which can be found elsewhere on our website. Please email walk@newburyrotary.org with any questions or to request a sponsorship form. You can turn up on the day but it would be very helpful if you emailed us beforehand to let us know that you intend to come.